Preparing a stable and level foundation is the first step in any new project, be it a repaved road or a new building. Without a good foundation, no project will stand up to the elements. This guiding principle has helped to make Reliable Contracting Co., Inc. one of the leading grading and excavating contractors in Central Maryland. 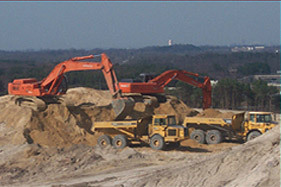 Utilizing state of the art equipment and experienced operators, Reliable’s Grading and Excavation Division performs a full range of earth moving services to prepare commercial, residential and government development sites in the State of Maryland for the construction of buildings, roads, parking lots and many other uses. As a full-service commercial site contractor, Reliable utilizes its own fleet of 15 off-road trucks and 250 pieces of earth moving equipment. We can move 10,000 cy of earth per day for mass grading projects, or a small parking lot with equally professional results. We serve the following areas: Millersville, Gambrills, Fort Meade, Odenton, Crofton, Baltimore , Bowie, Waldorf, White Plains, La Plata, Kent Island, Laurel, Severna Park & Washington DC. As well as Anne Arundel County, Prince George’s County, St. Mary’s County, Charles County, Montgomery County, Baltimore County, Kent County, Queen Anne’s County and Howard County. Fine grading for buildings, roads, and other uses. Snow removal for commercial and government property management as well has state highways. 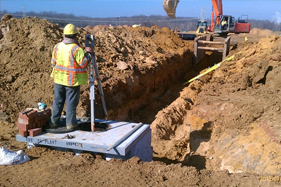 Reliable has been an innovator in the use of laser-guided leveling and is also experienced in the use of the latest satellite-based total site management systems. Our in-house survey crews ensure that your site plans are brought to reality with total accuracy, while our team of experienced estimators, project managers and field personnel evaluate and manage every phase of your project by identifying missing components of your plan, noting places where you can better leverage materials or technologies and finding ways to increase overall efficiency. 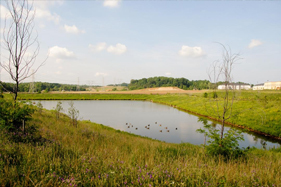 All of our office and field managers are “Green Card” holders –certified in sediment controls by the Maryland Department of the Environment, and currently in the process of switching to MDE’s new “Yellow Card”. Along with our thorough knowledge of local specifications and procedures, you can count on Reliable Contracting to provide service and quality that is second to none. It’s refreshing to work with a company that, without missing a beat, delivers turn-key site development services.